First, let’s talk about what they actually are. 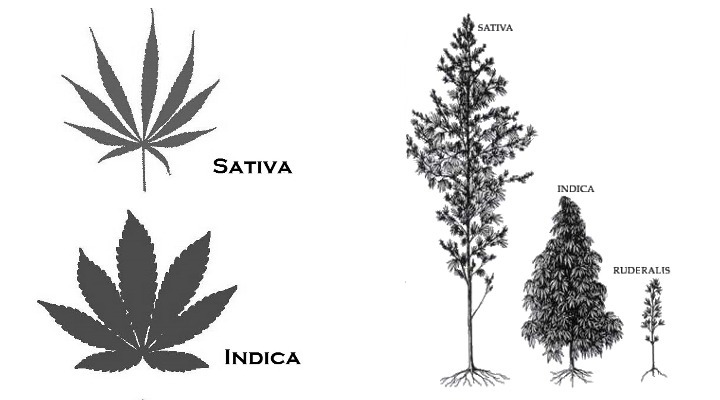 Cannabis indica and Cannabis sativa are actually two different strains of the marijuana crop. And though they’re similar, both species need to be grown in different ways. Indicas grow much better in cooler climates. Because of this, they make ideal indoor plants. Sativas generally need to grow outdoors in warm climates like South America and Southeast Asia. The indica plant is much bushier than its counterpart, and grows in shorter, bulkier trees. Sativa is known for its long, skinnier leaves and taller trees. You might notice the 3rd, tree hiding below the other two. This is the Cannabis ruderalis plant, a very low THC species, that is far inferior in terms of effects, and therefore not common on the market. The two main ingredients in marijuana that cause psychological and physical effects are THC and CBD. THC is the chemical that causes most psychoactive effects, while CBD is responsible for the physical effects. In general, sativas have a higher ratio of CBD to THC, while indicas have a higher ratio of THC to CBD. But what does this mean in terms of smoking the different strains? We know this is why you came. Casual smokers will tell you that weed is weed, but indica and sativa also produce wildly different effects. Let’s break it down. Indica tends to be calming and sedating, generally referred to as a body high. Most people recommend indicas for night time smoking because they can help you sleep. It is a great choice for smoking and having a relaxing night in. So make some popcorn, put on a movie, and roll up an indica joint. Sativa usually veers towards an energetic high. It is euphoric and cerebral and a great choice for outside activity. Generally, sativas are better for daytime activity because of the energy they give you. You should choose one if you’re going on a hike or spending the day at the beach, or even for going to the gym. It is up to you to choose which species will be the best for your personality or mood. But you don’t want to choose between the calming effects of indica and the energizing effect of sativa. Well then, have no fear, there is a solution. Hybrid plants are incredibly common and allow you to choose the effects of both. In fact, many places (including The Pot Vault) allow you to choose the percentage of each. For instance, The Pot Vault’s Amsterdam Gold strain is 70% indica and 30% sativa. This one gives you a nice, balanced high that veers a little towards the euphoric. So, now that you know the important differences between indica and sativa, remember to choose the strain that fits your mood an needs. Or, choose a hybrid and go for both! Stay stoned, friends.